A close-up of kale chips with olive oil and salt. 1 Are Green Bean Chips Healthy? 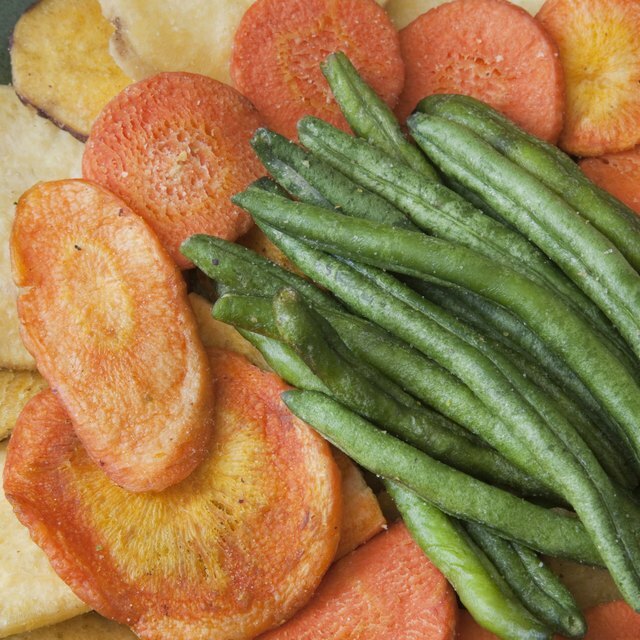 If a handful of crunchy potato chips is your idea of tasty snack, you probably already know it's not a healthy choice. The good news, however, is that kale chips can satisfy your craving for something crunchy without all of the saturated fat and sodium in their potato counterparts. Even better, kale chips are simple to make at home so you can always have a nutritious snack on hand. Kale, on its own, contains about 33 calories and less than 1 gram of fat per cup. When you consider that an ounce of potato chips contain 154 calories and 10.3 grams of fat, of which 1.1 grams are saturated, kale chips win. Even if you drizzle a serving of kale chips with a teaspoon of oil, such as olive, you'll only add 40 calories and 4.5 grams of fat, which is still less than that ounce of potato chips. Kale, even when baked into crispy chips, contains a wealth of certain nutrients. The leafy green vegetable is a good source of vitamin C, a nutrient that repairs cartilage and keeps your skin, bones, tendons and ligaments healthy. The dark green color of kale chips also signifies the presence of vitamin A. Vitamin A is essential for eye health, but it also keeps your skeleton and soft tissues healthy. 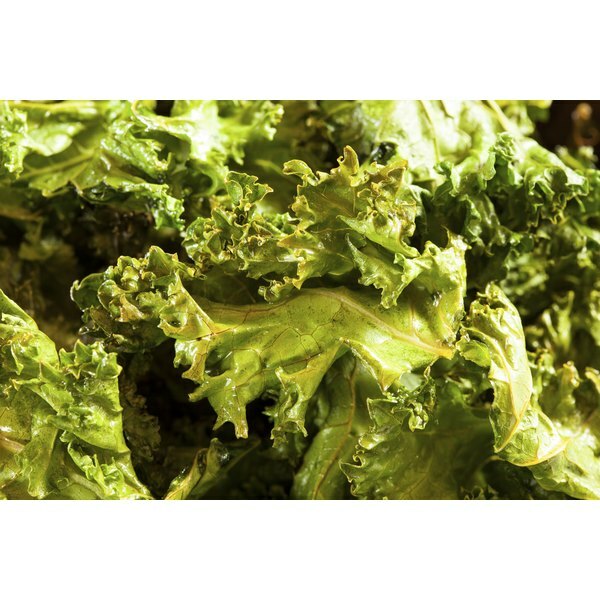 Kale is also an excellent source of vitamin K, a vitamin that enables blood to clot normally. Kale is chock-full of antioxidants. Antioxidants protect your overall health, but they can be particularly beneficial in reducing the risk of cancer, note Michael T. Murray and Joseph E. Pizzorno in their book "The Encyclopedia of Healing Foods." The antioxidants in kale can also help reduce inflammation in your body; decreased inflammation can help cut your risk of a host of medical conditions such as high cholesterol. Though some supermarkets and health foods stores sell prepackaged kale chips, these tend to be high in sodium. Making your own kale chips is a good alternative because you can take control of how salty they are. Evenly but lightly coat kale leaves with cooking oil, such as olive or canola, and sprinkle them with a dash of sea salt. Roast the kale until crispy, which will take about eight to 10 minutes. Don't cook the kale chips for too long, however, because the leaves will start to lose nutrients if they're overcooked.